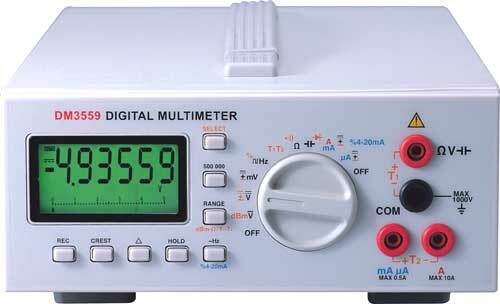 All-Bright DM3550 5-4/5 digits, 500,000 Counts Bench Digital Multimeter, provide you professional, stable, accuracy, and high resolution measurements. With a variety of functions, you can use it in any part of manufacturing processing from product developing, assembly testing to quality control. There are 2 models available, DM3557 and DM3559 (with RS-232 interface), which provide you the most cost effective choice. ．5-4/5 digits 500,000 counts DC voltage stable mode. ．6 digits 999,999 counts mode for Hz with 0.002%. ．High basic DCV accuracy (0.02% for DM3559, 0.03% for DM3557), fast measurement 5/sec. ．High bandwidth (100KHz for DM3559, 20KHz for DM3557) AC/AC+DC true RMS voltage function. ．High general (Ohm, capacitance e.g.) input protections (1000V for DM3559,600V for DM3557). ．T1-T2 dual channels K-type –50℃ to 1000℃ (only for DM3559). ．Optically isolated RS-232 PC interface capability (DM3559 only). ．Software for Windows 95/98TM (DM3559 only). ．Auto-ranging record MAX, MIN, MAX-MIN reading. ．Data hold, relative zero mode. ．High speed analog Bar-Graph updates 60/sec. ．DCV from 0.001mV to 1000V, ACV from 0.01mV to 1000V, DCA/ACA from 0.01μA to 20A. ．Ohm from 0.01 to 50M , capacitance from 10pF to 9999μF. ．Line level frequency with 4 selectable trigger levels. ．Digital logic level frequency from 5 Hz to 2MHz. ．Duty cycle % reading, diode test. ．%4-20mA process control loop current reading. ．dBm reading with 20 selectable impedance values. ．High-speed auto-ranging, fast audible continuity <100μS. ．Back-light large easy to read LCD display. Storage Temperature/Humidity Range : -10 to 60℃, <80% R.H.
Warm-up Time : Approx. 30 min.